This book features contributions from internationally renowned scientists from Europe and the USA covering aspects of immunoglobulin subclasses from a molecular and mechanistic approach. The first section presents a detailed discussion of the molecular structure and segmental flexibility of IgG subclasses, including how this controls their effector function. Structure-function relationships are fully developed in the second section by means of a functional approach to the study of complement activation and opsonization by IgG subclasses. 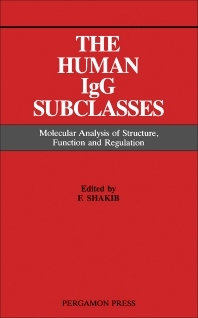 The final section contains a generous account of the regulation of IgG subclass expressions. For researchers in immunology and molecular geneticists. Section I: Structure. Introduction, R S H Pumphrey. Molecular structure of human IgG subclasses, R Jefferis. Fragmentation and conformational changes of IgG subclasses, T E Michaelsen. Molecular genetics of immunoglobulin allotype expression, M-P Lefranc & G Lefranc. Production and epitope location of monoclonal antibodies to the human IgG subclasses, R G Hamilton. Structure/function relationships of IgG subclasses, R Jefferis. Section II: Function. Membrane Fc receptors for IgG subclasses, J D Pound & M R Walker. The ability of IgG subclasses to cause the elimination of targets in vivo and to mediate their destruction by phagocytosis/cytolysis in vitro, E Wiener. Selective IgG subclass expression: biologic, clinical and functional significance, M G Scott, D E Briles & M H Nahm. Affinity of IgG subclass antibodies, M E Devey. Construction, expression and function of chimaeric antibodies, M Brüggemann. Section III: Regulation. Molecular genetics of immunoglobulin variable regions, M J Sims & M J Taussig. The cellular and molecular biology of cytokine-directed murine IgG isotype production, C M Snapper. Regulation of immunoglobulin isotypes by self structures, N R StC Sinclair. Subclass restrictions of IgG antibody responses, L Hammarström & C I E Smith.